Blue Whales are marine mammals and are the largest known mammal to have ever existed. They are found all over the world, from sub-polar to sub-tropical latitudes. 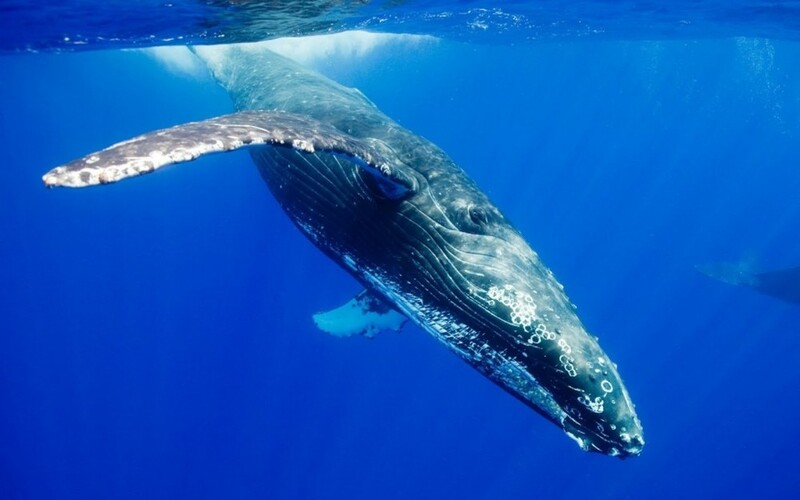 They are often found in coastal waters, for example off the coast of Southern California or in the Gulf of Maine, where many whale watches take place. Blue Whales are baleen whales, which means they feed by filtering water with their baleen plates instead of using teeth. Like other baleen whales, they feed almost exclusively on small crustaceans called krill. Because of their power, enormous size, and speed, Blue Whales have virtually no natural predators. However, Blue Whales were hunted almost to extinction until protected internationally in 1966. Blue Whales can become fatally wounded after colliding with ocean vessels, as well after becoming trapped or entangled in fishing gear. Another threat that faces Blue Whales is the ever-increasing amount of ocean noise, which includes sonar. This noise makes it more difficult for Blue Whales to communicate with one another. Blue Whales are listed as “endangered” under the Endangered Species Act by the National Marine Fisheries Service.